How did my Teen get Lice? The Selfie Generation has nearly as much head to head contact as their younger siblings do. This provides ample opportunities for lice to transfer. Head lice is a parasite typically associated with children. Many lice treatment products have packaging targeted towards children or even have images of children on the bottle. The reason for this is that lice are, of course, most common among children. They have close contact with more people than any other age group. Teens and adults are typically only going to have close contact with their family, close friends, or those of romantic interest. Children, in contrast, have many close friends that they may hug, rough-house with, play with, lean on or cuddle with daily. This increased amount of daily head-to-head contact puts children at a higher risk of receiving head lice. As we grow older we gain a sense of personal space and we do not necessarily make friends with every person in our class or workplace. If this is true, why has head lice become increasingly common and rampant among teenagers and young adults? The rise of selfies appears to be a major contributor to the rise in cases among these older age groups. Lice transfer by using the hair as a bridge to crawl on to another person’s head and they can move to a new host in as little as 3 seconds. When friends pose for selfies they typically have their heads together to squeeze into the photo. 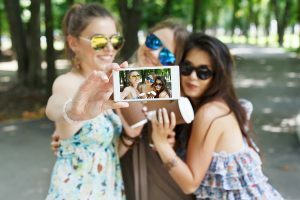 Later, in the day the teens that posed together in that selfie may be with different groups of friends that they then take more selfies with and lice again have the potential to spread. This direct head-to-head contact provides a louse a great opportunity to move to a new host. Teen girls with close nit friend groups are at an even higher risk for receiving head lice. They might be more likely to share hair brushes with friends, style and play with their friends’ hair, lounge or nap close to one another or take part in other behaviors that allow lice the chance to transfer. Teens on sports teams are also at an increased risk of receiving head lice because they may share this same closeness with their teammates in addition to group huddles, overnight trips and crowded bus rides. In recent years colleges have increasingly had outbreaks partly due to college students feeling that they are not at risk for head lice. College students take selfies almost as much as teenagers do and, for example, may squeeze in with friends to play with the newest Snapchat filters while they wait for class to begin. College students are also crammed into tiny crowded dorms. They might squeeze in together on a futon with friends to watch Netflix on a laptop, or have a few friends sleep over that must all sleep together on an air mattress. A dorm room is typically disorganized and in a rush to get to class, a student might chose to borrow their roommate’s hairbrush or comb. This all may seem like harmless college antics but it just takes one visit from a younger sibling for lice to be introduced to the college campus. With the close quarters and the highly social environment present on a college campus, lice can spread fast and quickly lead to an outbreak. No matter what age we are it is important to not share hair brushes and to avoid frequent head-to-head contact with others to prevent head lice. Anyone in a highly social environment faces a higher risk of getting head lice because head lice have evolved to take advantage of humans’ social nature. Even if you are in high school or college you should still take preventative measures and if you feel itchy, do not ignore it or dismiss it.